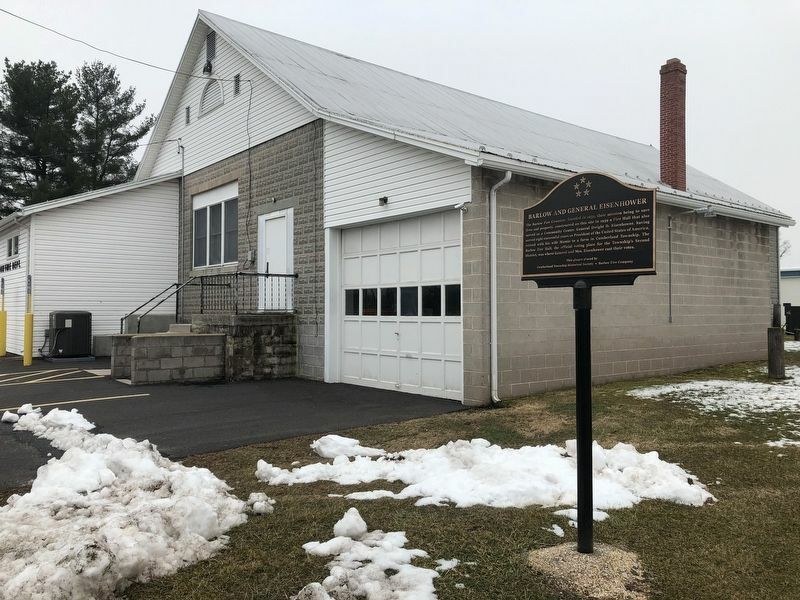 The Barlow Fire Company, founded in 1931, their mission being to save lives and property, constructed on this site in 1939 a Fire Hall that also served as a Community Center. General Dwight D. Eisenhower, having served eight successful years as President of the United States of America, retired with his wife Mamie to a farm in Cumberland Township. 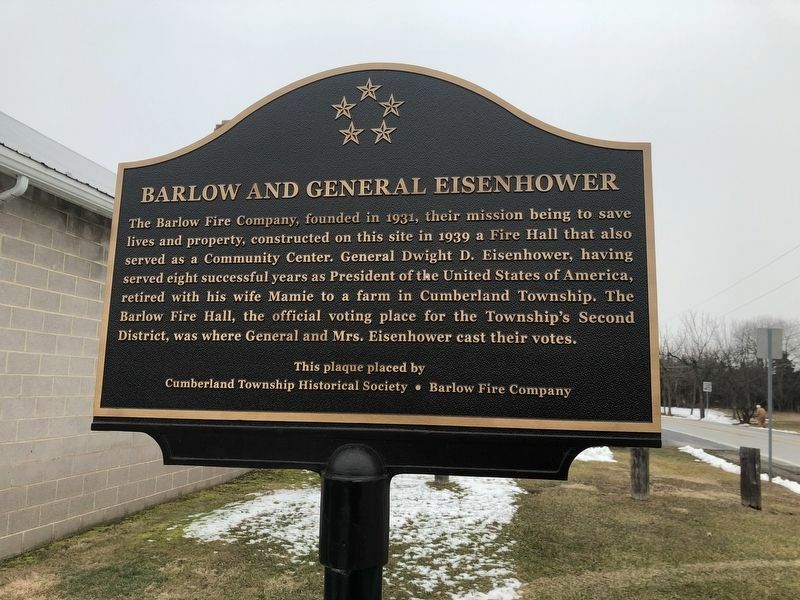 The Barlow Fire Hall, the official voting place for the Township's Second District, was where General and Mrs. Eisenhower cast their votes. Erected by Cumberland Township Historical Society, Barlow Fire Company. Location. 39° 45.732′ N, 77° 13.945′ W. Marker is in Cumberland Township, Pennsylvania, in Adams County. Marker is at the intersection of Taneytown Road (Pennsylvania Route 134) and Barlow Greenmount Road, on the right when traveling south on Taneytown Road. Touch for map. Marker is at or near this postal address: 2005 Taneytown Road, Gettysburg PA 17325, United States of America. Touch for directions. (approx. 1½ miles away); 49th Pennsylvania Infantry (approx. 1½ miles away); Third Brigade (approx. 1½ miles away); 6th Maine Infantry (approx. 1½ miles away); Battery C, First New York Light Artillery (approx. 1½ miles away); 119th Pennsylvania Infantry (approx. 1½ miles away); 1st & 2nd Regiments United States Cavalry (approx. 1½ miles away). More. Search the internet for Barlow and General Eisenhower. Credits. This page was last revised on February 26, 2019. This page originally submitted on February 24, 2019, by Devry Becker Jones of Washington, District of Columbia. This page has been viewed 27 times since then. Photos: 1, 2. submitted on February 24, 2019, by Devry Becker Jones of Washington, District of Columbia. • Bill Pfingsten was the editor who published this page.